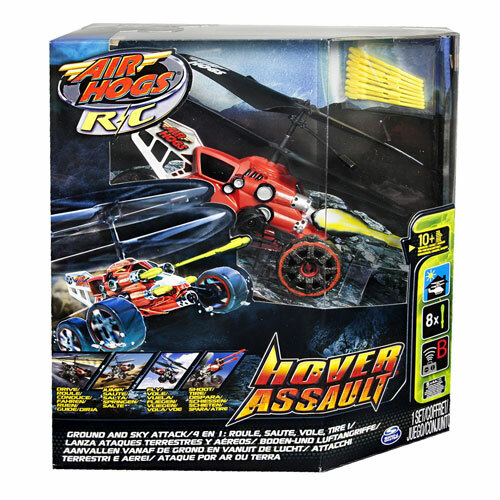 Conquer the ground and command the sky with the Air Hogs Hover Assault. It's the ultimate fusion of ground and air R/C technology. Explore terrain that no other vehicle can as you drive, jump and fly this powerful hybrid R/C. Speed across the ground as you engage the intelligent propeller system and hop or soar over obstacles. Fire quick bursts of aerial navigation or launch your way into full on flight. Unleash a fury of 4 plastic missiles on the included targets. Whether on land or in the air, nothing can stop the Air Hogs Hover Assault.